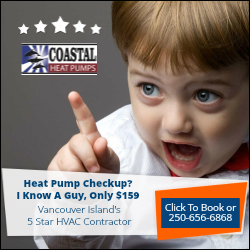 Air source heat pumps are the most common type of heat pump installed in greater Victoria (although ductless heat pumps are making inroads in many retrofitted homes and apartments with baseboard heaters). Why are they so popular? Because air source systems can your electricity use by up to 50%. Plus they offer you the added benefit of air conditioning in the warm months. If you are converting from a gas or oil furnace, air source heat pumps can reduce your carbon footprint substantially. The performance of modern air source heat pumps is up to two times better than those from even a decade ago. ENERGY STAR® models use at least 15-25% less energy than standard models. Coastal recommends using Energy Star-rated heat pumps for maximum energy savings. In addition to saving money on utility bills, air source heat pumps reduce your greenhouse gas emissions. If you use hydro electricity for your home heating, far less pollution is produced. Modern gas and oil furnaces burn much cleaner and more efficiently than those from just 10 or 20 years ago. However, even these furnaces require vents to exhaust carbon monoxide. As well, pilot lights need to be constantly monitored for safety reasons. Plus, if you have ever smelled the air on a cold Victoria day, you know that many people are still using wood, oil and gas to heat their homes. Isn’t it time to make the switch? Qualified air source heat pump installers are not be easy to find. Undersizing the heat pump can cause the units to run continuously, wasting energy and wearing out the compressor prematurely. With an air source heat pump, sealing the duct work from leaks and sizing the return air vents is critical for longevity of the equipment and your comfort. Placement of the outdoor unit away from windows and neighbours is also important. Our installers are journeyman refrigeration and ventilation professionals who can help you resolve these issues. Book an in-home consultation with a Coastal air source heat pump expert now!